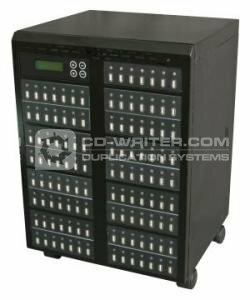 StorDigital USB Duplicator is a standalone, high speed, highly efficient device which provides an easy copy solution. Models ranging from 6 to 118 targets are available to meet different capacity needs of customers. A full range of flash duplicators starting from 6 up to 118 targets. Standalone operation, no need of PC, has no risk of virus infection. High writing speed without bandwidth sharing while copying numerous Flash devices. The maximum speed support up to 33MB per second. Unbeatable compatibility. StorDigital Flash duplicator has been approved and adopted by many worldwide big name flash devices makers. From high quality to downgrade flash, this duplicator is well experienced and highly compatible. Smart asynchronous copy. For small size content preload job, asynchronous allows non-stop copying by continuously device plug and pull. Support Media USB1.1 / USB2.0 / SD / SDHC / microSD / miniSD / CF Card Display Monochrome LCD display Input 4 push buttons ( , , OK, ESC ) LED LED (Green / Red) on rach slot Temperature Power Supply 80W or up (depends on different type of system requirement) support AC115~230V full range power Safety FCC, CE, RoHS The above information is for marketing reference only. The actual specification may subject to change without notice. The number of port and interface (SD/USB/CF/microSD) can be selected and increased based on customer requirement. StorDigital . 118 . Target . USB . Copier .